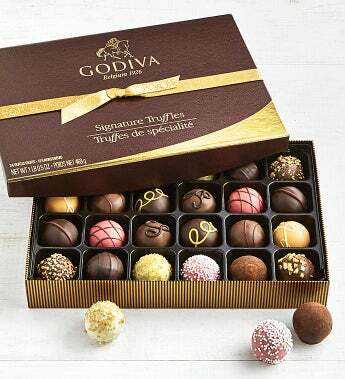 Godiva chocolatier has paired innovative flavors with the classic chocolate truffle for an unparalleled taste sensation and a fabulous go-to gift for everyone on your list. They'll love the ganache filled truffles in flavors like Creme Brulee, Strawberry Creme Tarte, Salted Caramel, Milk Chocolate Mousse and more. Gift Measures 10.75" x 6.75" x 1.5"